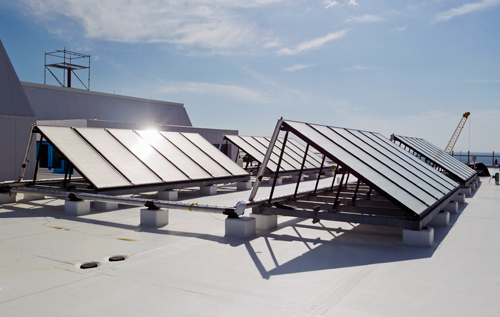 Bermuda’s largest solar panel system is on the roof of the new Acute Care Wing of the King Edward VII Memorial Hospital. The state of the art solar plant installed by Bermuda Engineering Co. Ltd (BE Solar) for Paget Health Services comprises nearly 1000 square feet of panels to capture the energy of the sun and use it to heat water. The panels chosen for this project have a proven track record of installations in salt laden atmospheres like Bermuda’s. Bermuda’s added vulnerability to hurricanes was also taken into consideration and special attention was given to designing and supplying a structural support system that will withstand the high winds while keeping the panels sloped at the optimum angle to the sun. This solar thermal system will produce up to 900 gallons of hot water per day which will offset a significant proportion of the Acute Care Wing’s hot water demand, allowing the hospital to reduce its operating costs and reliance on energy produced by fossil fuels. Will liquefied natural gas lower energy costs here?